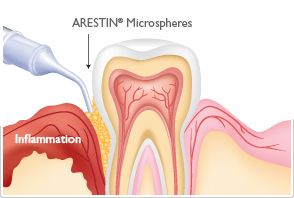 Arestin is an antibiotic that combats gum disease. In the event of gum disease, scaling and root planing are needed to improve the health of your teeth and gums. Bacteria is the cause of gum disease. Arestin helps kill this bacteria.